The healthcare industry now has more data than ever. It can be challenging to corral and understand massive amounts of data from a variety of systems. There’s data from patient care, supply chain, insurance billing, compliance, operations—and the list goes on. And there’s often variance and disparity within each of those buckets. But when the right sources are streamlined and analyzed properly, data can be a huge asset, helping drive operational efficiencies and better patient outcomes. Just take a look at these four ways data can improve everything from population health management to revenue cycle management. Self-service analytics empowers both individual healthcare employees and entire enterprises to see and understand data across every system—operational, financial, and clinical. With direct access and the ability to explore population-risk stratification data, physicians, clinicians, and care coordinators can monitor, measure, and understand the risk and financial implications of his or her treatment protocols and decisions on a per-patient basis. Providence Health, a 34-hospital network, has tons of data, hundreds of disconnected systems, and thousands of disjointed reports. In order to successfully move to new value-based model standards, Providence needed to simultaneously streamline operational reporting and improve clinical productivity. Providence created an enterprise self-service analytics platform, internally named Vantage, to allow anyone in the organization to monitor, analyze, and improve any related clinical outcome with data. 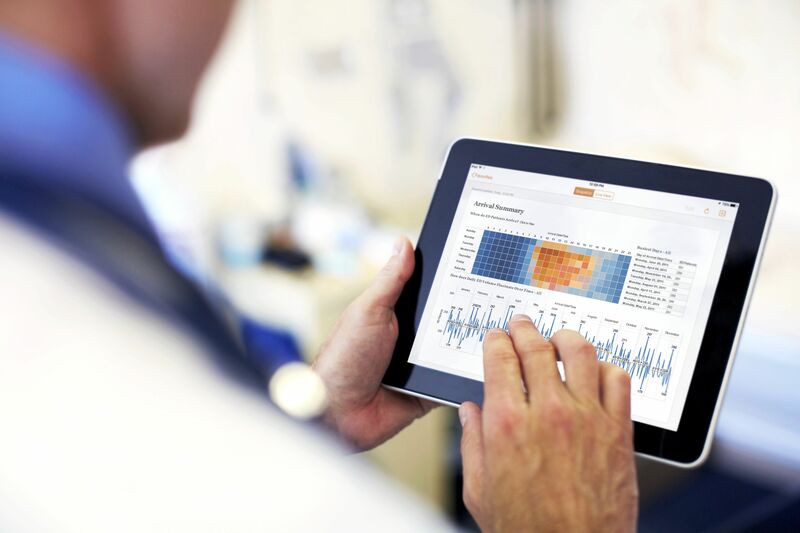 Vantage empowers people to find insights and track financial and clinical KPIs. People can track each region’s quality of care and spending at both the provider level as well as on a physician scorecard. More than 26,000 Providence employees adopted Vantage in the very first year, and the results are actually saving lives through programs like its proactive cancer-screening efforts for colon, colorectal, and breast cancer. Whether data is from this year, this week, or a few minutes ago, there’s no doubt reliable data will elevate operational efficiency. In order to drive decisions at the speed of business, data must be current. Proactive healthcare organizations are turning to right-time data feeds to improve decision-making, and track costs and outcomes as they go. Piedmont Healthcare, a six-hospital nonprofit healthcare system with more than 1,600 medical employees and affiliate physicians, lacked a productive scheduling system and struggled with declining labor productivity. Accessing right-time data has helped Piedmont Healthcare reorganize schedules and pivot. “We were able to cut out third-party physician-consulting services and some additional third-party work that was being done on the weekends. That, in total, saved us a little over $2 million a year,” says Mark Jackson, Director of Business Intelligence at Piedmont Healthcare. Standardization of staffing with real-time data allowed physicians to focus their attention on one patient-centered activity at a time. Piedmont has seen a 50 percent improvement in its variance from benchmark lengths of stay and a 10 percent reduction in readmissions for heart failure and heart attacks. Healthcare organizations accumulate massive amounts of data that’s stored in silos across the entire enterprise. These silos make it difficult to spot savings opportunities in the thousands of daily supply chains. Connecting these islands of information is key to understanding the big picture and making smarter buying decisions. The ability to aggregate and blend data on a common field is key. From drugs and medical devices to equipment and business assets, hospitals have huge inventories to manage. With data disjointed and supply and demand for thousands of different items always in flux, decision-makers are prone to wild and inefficient purchasing (known as maverick-buying) outside of the standard processes. Dashboards created with data from multiple sources will generate more accurate visuals and offer 360-degree assessments of supply chains, reducing excess and obsolete inventory while minimizing clinical staff involvement with ordering and replenishment. Barnes-Jewish Healthcare (BJC), an 11-hospital network with more than 1,300 beds, lacked visibility into its own inventory supply chain strategy. BJC had one single employee performing supply-chain analysis in Excel. Without a fast and easy way to identify cost savings opportunities, the approach was costing BJC millions in time and money. By aggregating and visualizing all of the data, BJC reduced supply-chain spending by more than $200 million over four years. BJC Healthcare was recognized with the prestigious Gartner Supply Chainnovator Award for its accomplishments. BJC uses a centralized dashboard to monitor, track and improve performance against targeted supply chain cost savings annually. “Every one-percent reduction in supply spending is equal to hiring 500 full-time equivalent caregivers. With our Supply Plus Initiative and data visualization, BJC Healthcare has saved $212 million on supply chain spending over the past four years,” says Lynn Kersting, Strategic Supply Chain Manager at BJC. Spreadsheets are the wrong tool for ad hoc financial reporting in healthcare. Too often, mistakes are made at the expense of efficiency, accuracy, and even thousands of hours of lost time. Augmenting financial analysis with automated data visualization can take a four-hour process involving many tools and high-level expertise and turn it into a four-second query. Michigan Medicine, a three-hospital and 40-outpatient hospital network, used to manage a large, archaic billing system with spreadsheets. To produce reports, the staff either had to do the coding themselves or pay large fees to an outside vendor. And the final output was often late or incorrect. Michigan Medicine needed a better and faster way to get the reports they needed—and it wanted control over their own financial and revenue systems. By automating visual reports, Michigan Medicine's financial teams have saved over 5,000 hours on four different projects within a single year. “Data visualization allows us to quickly automate processes that used to take thousands—literally thousands—of hours into seconds,” says Jonathan Greenberg, IT Director of Michigan Medicine. Successfully adopting the Accountable Care Organizations (ACO) model, complying with new healthcare-industry mandates, and maximizing reimbursements all requires operational excellence. Monitoring, measuring, and analyzing data to improve patient safety, care quality, operational costs, and compliance is easier than you think. And integrating self-service data visualization into your healthcare operations and processes is even easier. To learn more, check out our slideshare on leveraging data to improve healthcare outcomes. And visit our page on healthcare analytics.